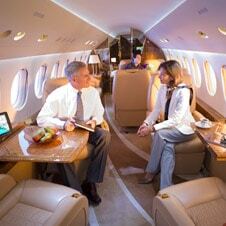 One of the most prestigious aircraft available for charter it is capable of flying from New York to Tokyo non-stop. It’s a large cabin typically featuring comfortable seating for 12/16 passengers with all the very latest cabin facilities including satellite communication systems. The large oval windows which are unique to Gulfstream allow much more natural light into the cabin increasing passenger comfort. Luggage capacity is generous and the G550 can fly non stop for up to 13 hours.